Mayor Kevin Faulconer was joined by other state and local officials Wednesday to open a 201-unit affordable-housing development in downtown’s East Village. 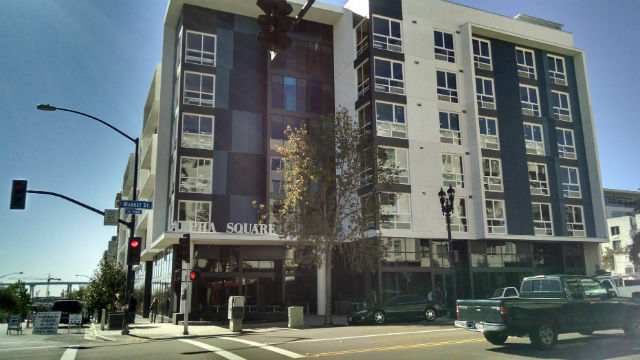 The $47.6 million Alpha Square Apartments were a joint effort by the San Diego Housing Commission, the City of San Diego, the Alpha Project for the homeless and Chelsea Investment Corporation, a developer focused on affordable housing. The furnished studio apartments will be rented for $399 to $635 per month to formerly homeless and low-income San Diegans based on their income. The 260-square-foot units include bathrooms, cooktops and air-conditioning. Each is furnished with a bed, nightstand, writing desk and television. “Alpha Square is going to be a home for those who need a little bit of help. It’s a new beginning for San Diegans looking for a fresh start on their lives,” said Faulconer, who was joined by Assembly Speaker Toni Atkins and Councilman Todd Gloria in cutting a ribbon. Atkins said the successful completion of the project was due to a strong partnership in San Diego to address the problem of homelessness. “Housing is the foundation for any success that any of us could have individually,” she said. Gloria said it is less expensive for taxpayers to provide housing and break the cycle of homelessness, noting that San Diego has an estimated 8,700 people on the streets. “It’s so much more expensive to the taxpayers to maintain the status quo,” he said. Applicants for the new housing can only earn between 30 percent and 60 percent of the San Diego area’s median income, or between $17,050 and $34,020 a year. Funding comes from federal housing vouchers. “They’re not taking a handout and a free gift. They’re expected to contribute. We’re helping them to stand up,” said Gary Gramling, chairman of the housing commission. Alpha Square replaces the old Hotel Metro, an earlier project for the homeless, that was torn down.